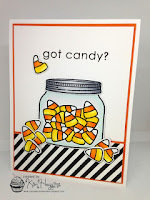 There's a Card for That: Hello Halloween Series | Watercolour Pumpkin Patch ft. MFT's "Witch Way is the Candy?" Hello Halloween Series | Watercolour Pumpkin Patch ft. MFT's "Witch Way is the Candy?" Today is the last (official) card for this year's Hello Halloween Series! Part of me is glad that it's over, it's been a long road, and another part of me is sad because I keep getting inspired by all the amazing work I'm seeing this year. So don't be too surprised if another couple cards pop up over the weeks to come. To begin, I stamped the two pumpkins from MFT's "Witch Way is the Candy?" set with Antique Linen Distress ink on Strathmore 140lb cold press watercolour paper. If I were to redo this card, I probably would mask off the front pumpkins - I had thought that the water and other inks would lift the lines out completely but they didn't. But the more I look at it, the more "artsy and rustic" it felt and I really fell in love with it. I then used Dried Marigold, Spiced Marmalade and Carved Pumpkin Distress inks to paint the pumpkins. I used just a bit of Scattered Straw to pull out the highlights. For the stems I used Forest Moss and Gathered Twigs. After that was completely dry, I used very watered down Gathered Twigs for the ground and then added more pigment to create the shadows. The darkest shadows are made with Ground Espresso. Once that was completely dry, I wet the area above the pumpkins with clean water and dropped in Weathered Wood and a bit of Faded Jeans to create the rest of the background, letting the water pull the ink away from the pumpkins and fade out. The greeting is stamped from Verve's "Autumn Splendor using Forest Moss Distress ink, using the MISTI so I could ensure a good impression. To finish off the card, I mounted the watercolour panel to a piece of dark green cardstock then adhered the whole lot to a standard A2 sized card base. I pulled my inspiration from her colours and the crisp clean greeting at the top. And Halloween. YAY! Your card is gorgeous. Just love your coloring. Wow! Your colouring is absolutey stunning! What a gorgeous fall scene - full of warmth! 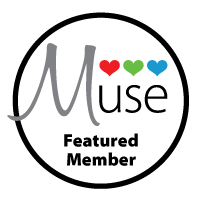 Thanks so much for joining us at Muse this week, Trina! Wow, I love your colouring on this, it's beautiful! These are beautiful. I can't imagine ever being able to paint like that. You do such a good job with shadows and highlights. This is so beautiful...love your incredible collection of stunning pumpkins! Forgot to thank you for playing along with us at Muse!